Building coverage ratio: 60%, Floor area ratio: 200%. Loamy layer, Sandy soil layer, Cohesive soil layer, Gravelly soil layer. To enter into a Pollution Control Agreement based on the Act of Preserving Living Environment in Tochigi. To drain to the exclusive drain pipe, after the processing by each company individually. 7.5 km from JR Oyama station on JR Utsunomiya Line or Tohoku-shinkansen. 2.5 km from New National Route 4. 6.0 km from National Route 50. To be a factory, etc. located first time in Oyama Higashi Industrial Park. To start its operation within 5 years from the date of the land acquisition. An equivalent amount of the fixed assets tax for the land acquired. Land acquisition amount of less than 1.5 billion yen : 15% of the land acquisition value. Land acquisition amount of 1.5 billion yen or more and less than 3 billion yen: 20% of the land acquisition value. Land acquisition amount of 3 billion yen or more : 25% of the land acquisition value. Those who build, or transfer, or renovate factories, etc. at the industrial parks in the city, and designated operators prescribed in the Basic Act for Small and Medium Sized Enterprises. Financing for the land acquisition and factories, etc. construction. Financing limit：A smaller amount either 95% of the total projected cost or 150 million yen. Redemption period：For 15 years （a grace period of up to 2 years). 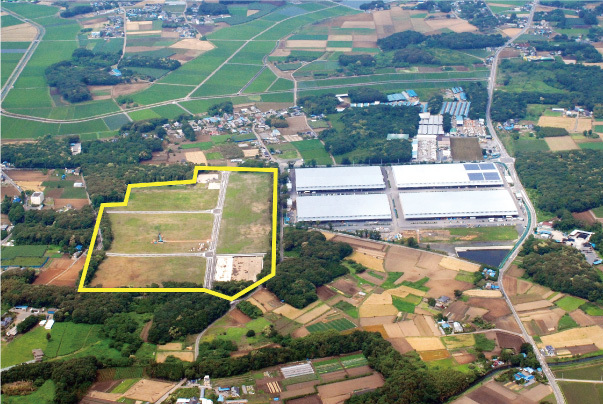 In the case enterprises, who locate first time in Oyama Higashi Industrial Park, build new factory, etc. , and being funded according with the rules of the Act of Industrial Promotion of Oyama City, and comply with all of the following conditions. Enterprises funded by the finance institutions in Oyama with a guarantee from Tochigi Credit Guarantee Associations. To start its operation within 3 years from the date of the acquisition of land. Within the loan amount, an equivalent amount of the credit guarantee charge up to 50 million yen (only one time between after the purchasing contract and the start of its first operation). Those who employed new employees, etc. (includes employees transferred from a factory outside Oyama to the factory inside Oyama) by the new establishment of factories or addition of facilities, and comply with the following requirements. As of the date of 1 year from the operation starting date, the office is located in Oyama and employing 10 or more continuously employed full-time employees (excludes part-timers) who employed newly or transferred. Not to receive the grant of the Oyama City Employment Promotion Incentives. 100,000 yen per subjected employee. Limit amount is 10 million yen. Copyright(c) Department of Industry, Labor and Tourism Industrial Policy Ｓection, Industrial Location Group 2010 All Rights Reserved.